It’s that time of year, when the abundance of zucchini begins to appear. My readers are searching my site for zucchini recipes, so I would like to add another for your review. And by the way, if anyone has zucchini they want to anonymously leave on my doorstep, I live in Torrance, California. This may be one of those ‘be careful what you wish for’ things, but I really love zucchini. Bring it on. 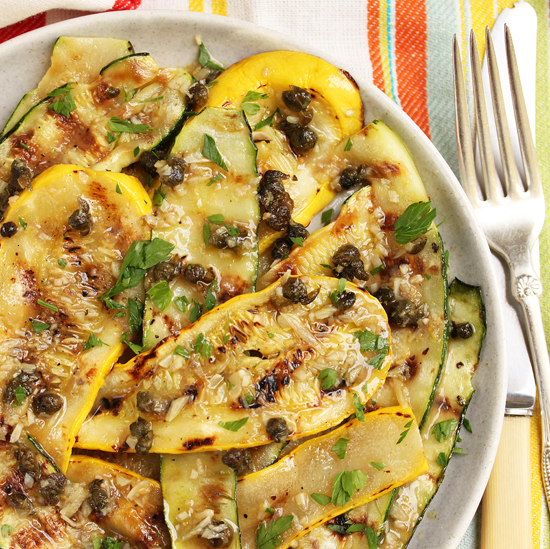 For this grilled zucchini recipe, you really have to love anchovies. And garlic. 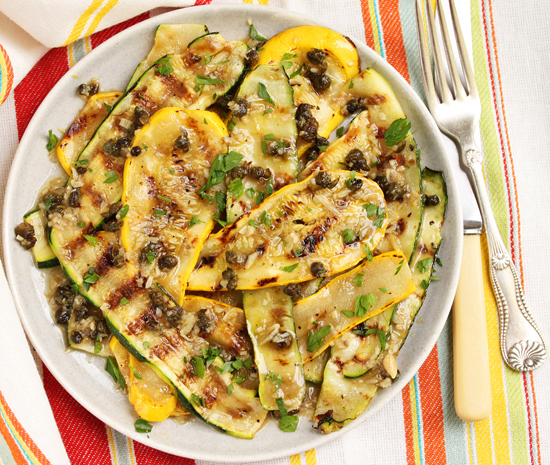 The sauce is salty and complements the sweet charred flavors of the zucchini. With the little piquant crunch of the capers. This would be a great side dish with grilled chicken or steak. I can imagine this sauce on the beef slices or even grilled potatoes. Is your mouth watering yet? 1. In a medium skillet, heat the 1/3 cup olive oil over medium heat. Add capers and cook for about 2 minutes until they start to sizzle. 2. Reduce heat to medium low and cook capers until they are crisp, about 4 minutes. Transfer capers with a slotted spoon to paper towels to drain. 3. Stir anchovies and garlic into olive oil in skillet. Cook over low heat until garlic is just golden, about 10 minutes. Remove skillet from heat. Cool to warm. 4. Add lemon zest, lemon juice, minced parsley and fried capers to oil in skillet. 5. Light a grill or heat grill pan on stove. Brush zucchini and yellow squash with olive oil and dust with salt and black pepper. Grill over high heat until grill marks appear, turn and grill other side. 6. Transfer grilled slices to serving platter or individual plates. Drizzle anchovy caper sauce over slices and sprinkle with roughly chopped parsley. Serve. Wow, this looks like a winner! Love the colors and design! Am thinking it’s great even without the ‘chovies. If I don’t have a grill or grill pan, can I make the marks with a Sharpie?